Traumatic brain injury (TBI) is sudden damage to the brain caused by a blow or jolt to the head. Common causes include car or motorcycle crashes, falls, sports injuries, and assaults. Injuries can range from mild concussions to severe permanent brain damage. While treatment for mild TBI may include rest and medication, severe TBI may require intensive care and life-saving surgery. Those who survive a brain injury can face lasting effects in their physical and mental abilities as well as emotions and personality. Most people who suffer moderate to severe TBI will need rehabilitation to recover and relearn skills. TBI is an injury to the brain caused by a blow or jolt to the head from blunt or penetrating trauma. The injury that occurs at the moment of impact is known as the primary injury. Primary injuries can involve a specific lobe of the brain or can involve the entire brain. Sometimes the skull may be fractured, but not always. During the impact of an accident, the brain crashes back and forth inside the skull causing bruising, bleeding, and tearing of nerve fibers (Fig. 1). Immediately after the accident the person may be confused, not remember what happened, have blurry vision and dizziness, or lose consciousness. At first the person may appear fine, but their condition can decline rapidly. After the initial impact occurs, the brain undergoes a delayed trauma – it swells – pushing itself against the skull and reducing the flow of oxygen-rich blood. This is called secondary injury, which is often more damaging than the primary injury. Figure 1. 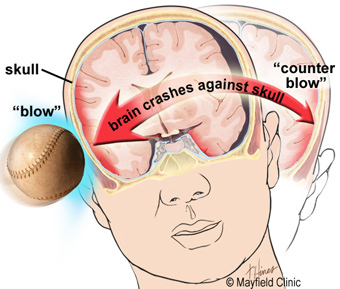 During impact to the head, the soft brain crashes back and forth against the inside of the hard skull causing bruising, bleeding, and shearing of the brain. Mild: person is awake; eyes open. Symptoms can include confusion, disorientation, memory loss, headache, and brief loss of consciousness. Moderate: person is lethargic; eyes open to stimulation. Loss of consciousness lasting 20 minutes to 6 hours. Some brain swelling or bleeding causing sleepiness, but still arousable. Severe: person is unconscious; eyes do not open, even with stimulation. Loss of consciousness lasting more than 6 hours. Concussion is a mild head injury that can cause a brief loss of consciousness and usually does not cause permanent brain injury. Contusion is a bruise to a specific area of the brain caused by an impact to the head; also called coup or contrecoup injuries. In coup injuries, the brain is injured directly under the area of impact, while in contrecoup injuries it is injured on the side opposite the impact. Diffuse axonal injury (DAI) is a shearing and stretching of the nerve cells at the cellular level. It occurs when the brain quickly moves back and forth inside the skull, tearing and damaging the nerve axons. Axons connect one nerve cell to another throughout the brain, like telephone wires. Widespread axonal injury disrupts the brain's normal transmission of information and can result in substantial changes in a person's wakefulness. Traumatic Subarachnoid Hemorrhage (tSAH) is bleeding into the space that surrounds the brain. This space is normally filled with cerebrospinal fluid (CSF), which acts as a floating cushion to protect the brain. Traumatic SAH occurs when small arteries tear during the initial injury. The blood spreads over the surface of the brain causing widespread effects. Hematoma is a blood clot that forms when a blood vessel ruptures. Blood that escapes the normal bloodstream starts to thicken and clot. Clotting is the body's natural way to stop the bleeding. A hematoma may be small or it may grow large and compress the brain. Symptoms vary depending on the location of the clot. A clot that forms between the skull and the dura lining of the brain is called an epidural hematoma. A clot that forms between the brain and the dura is called a subdural hematoma. A clot that forms deep within the brain tissue itself is called an intracerebral hematoma. Over time the body reabsorbs the clot. Sometimes surgery is performed to remove large clots. Although described as individual injuries, a person who has suffered a TBI is more likely to have a combination of injuries, each of which may have a different level of severity. This makes answering questions like “what part of the brain is hurt?” difficult, as more than one area is usually involved. Secondary brain injury occurs as a result of the body's inflammatory response to the primary injury. Extra fluid and nutrients accumulate in an attempt to heal the injury. In other areas of the body, this is a good and expected result that helps the body heal. However, brain inflammation can be dangerous because the rigid skull limits the space available for the extra fluid and nutrients. Brain swelling increases pressure within the head, which causes injury to parts of the brain that were not initially injured. The swelling happens gradually and can occur up to 5 days after the injury. Diffuse injuries (such as a concussion or diffuse axonal injury) will typically cause an overall decreased level of consciousness. Whereas, focal injuries (such as an ICH or a contusion) will have symptoms based on the brain area affected (Fig. 2). Figure 2. The brain is composed of three parts: the brainstem, cerebellum, and cerebrum, which is divided into lobes. 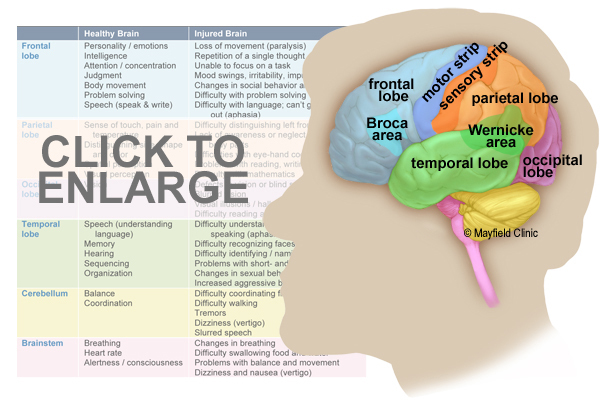 The table lists the lobes of the brain and their normal functions as well as problems that may occur when injured. While an injury may occur in a specific area, it is important to understand that the brain functions as a whole by interrelating its component parts. Every patient is unique and some injuries can involve more than one area or a partial section, making it difficult to predict which specific symptoms the patient will experience. Common causes include falls, car or motorcycle crashes, vehicular accidents involving pedestrians, athletics, and assaults with or without a weapon. Approximately 1.5 to 2 million adults and children suffer a traumatic brain injury (TBI) each year in the United States. Most people who experience a head injury, about 1.1 million, will have a mild injury that does not require an admission to the hospital. Another 235,000 individuals will be hospitalized with a moderate to severe head injury, and approximately 50,000 will die. When a person is brought to the emergency room with a head injury, doctors will learn as much as possible about his or her symptoms and how the injury occurred. The person's condition is assessed quickly to determine the extent of injury. The Glasgow Coma Score (GCS) is a 15-point test used to grade a patient's level of consciousness. Doctors assess the patient's ability to 1) open his or her eyes, 2) ability to respond appropriately to orientation questions, (“What is your name? What is the date today?”), and 3) ability to follow commands (“Hold up two fingers, or give a thumbs up”). If unconscious or unable to follow commands, his or her response to painful stimulation is checked. A number is taken from each category and added together to get the total GCS score. The score ranges from 3 to 15 and helps doctors classify an injury as mild, moderate, or severe. Mild TBI has a score of 13-15. Moderate TBI has a score of 9-12, and severe TBI has a score of 8 and below. Figure 3. 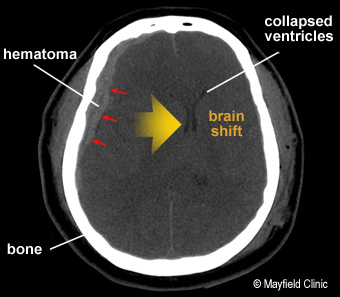 CT scan shows a blood clot (hematoma) collecting under the bone (red arrows) and displacing brain (yellow arrow) to the other side of the skull. Computed Tomography (CT) is a noninvasive X-ray that provides detailed images of anatomical structures within the brain. 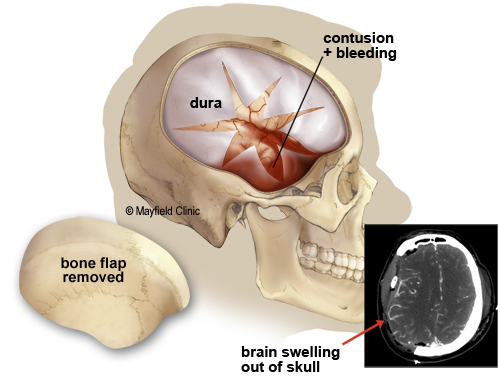 A CT scan of the head is taken at the time of injury to quickly identify fractures, bleeding in the brain, blood clots (hematomas) and the extent of injury (Fig. 3). CT scans are used throughout recovery to evaluate the evolution of the injury and to help guide decision-making about the patient's care. Magnetic Resonance Imaging (MRI) is a noninvasive test that uses a magnetic field and radiofrequency waves to give a detailed view of the soft tissues of the brain. A dye (contrast agent) may be injected into the patient's bloodstream. MRI can detect subtle changes in the brain that cannot be seen on a CT scan. Magnetic Resonance Spectroscopy (MRS) gives information about the metabolism of the brain. The numbers generated from this scan provide a general prognosis about the patient's ability to recover from the injury. Mild TBI usually requires rest and medication to relieve headache. Moderate to severe TBI require intensive care in a hospital. Bleeding and swelling in the brain can become an emergency that requires surgery. However, there are times when a patient does not require surgery and can be safely monitored by nurses and physicians in the neuroscience intensive care unit (NSICU). The goals of treatment are to resuscitate and support the critically ill patient, minimize secondary brain injury and complications, and facilitate the patient's transition to a recovery environment. Despite significant research, doctors only have measures to control brain swelling, but do not have a way to eliminate swelling from occurring. Neurocritical care is the intensive care of patients who have suffered a life-threatening brain injury. Many patients with severe TBI are comatose or paralyzed; they also may have suffered injuries in other parts of the body. Their care is overseen by a neurointensivist, a specialty-trained physician who coordinates the patient's complex neurological and medical care. Patients are monitored and awakened every hour for nursing assessments of their mental status or brain function. Figure 4. In the NSICU, the patient is connected to numerous machines, tubes, and monitors. The monitoring equipment provides information about body functions and helps guide care. Some equipment may take over certain functions, such as breathing, nutrition, and urination, until the patient's body is able to do these things on its own. Figure 5. A brain oxygen and cerebral blood flow monitor is inserted into the brain tissue and secured to the skull with a bolt. A catheter is inserted into the ventricle of the brain to monitor intracranial pressure (ICP). If pressure is too high, the CSF fluid can be drained from the ventricles. Intracranial pressure (ICP) monitor. 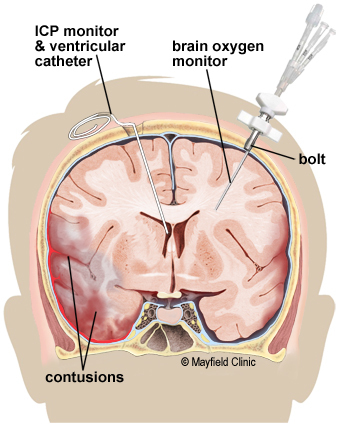 A catheter is placed through a small hole in the skull and positioned inside the ventricle (fluid-filled area deep within the brain) to measure pressure inside the head (Fig. 5). The ICP monitor allows the NSICU team to intervene quickly if the pressure becomes too high. Typical intracranial pressure is less than 20 mmHg. However, there are times when a higher number is safe and acceptable. Brain oxygen monitor (Licox). A catheter is placed through a small hole in the skull and positioned within the brain tissue. The Licox measures the oxygen level and temperature within the brain. Adjustments in the amount of oxygen given to the patient are often made to maximize the brain's oxygen level. A cerebral blood flow monitor, called a Hemedex, is a newer monitor that is placed with the Licox and helps the NSICU team evaluate blood flow through the brain. Ventilator. Some patients may require a ventilator, a machine that helps them breathe. The ventilator is connected to the patient by the endotracheal tube, or ET tube. The tube is placed into the patient's mouth and down into the trachea, or windpipe. The tube allows the machine to push air into and out of the lungs, thereby helping the patient breathe. Feeding tube. When patients are on a ventilator or have a decreased level of alertness, they may not be able to eat or get sufficient nutrition to meet their needs. A nasal-gastric feeding tube may be inserted through the patient's nose and passed down the throat into the stomach. It delivers liquid nutrition as well as any medication that is required. Seizures and EEG monitoring. A seizure is an abnormal electrical discharge from the brain. Approximately 24% of patients who suffer a TBI will have a seizure that is undetected unless they are monitored by an electroencephalogram (EEG). Seizures that are not visible to the human eye are referred to as non-convulsive seizures. Because these seizures are serious, all patients with a severe TBI are monitored with continuous EEG for 24 to 72 hours after injury. Sedation and pain. After a head injury it may be necessary to keep the patient sedated with medications. These medications can be turned off quickly in order to awaken the patient and check their mental status. Because patients often have other injuries, pain medication is given to keep them comfortable. Controlling intracranial pressure. Hypertonic saline is a medication used to control pressure within the brain. It works by drawing the extra water out of the brain cells into the blood vessels and allowing the kidneys to filter it out of the blood. Preventing seizures. Patients who've had a moderate to severe traumatic brain injury are at higher risk of having seizures during the first week after their injury. Patients are given an anti-seizure medication (levetiracetam or phenytoin) to prevent seizures from occurring. Preventing infection. Although every attempt is made to prevent infection, the risk is always present. Any device placed within the patient has the potential to introduce a microbe. If an infection is suspected, a test will be sent to a laboratory for analysis. If an infection is present, it will be treated with antibiotics. Surgery is sometimes necessary to repair skull fractures, repair bleeding vessels, or remove large blood clots (hematomas). It is also performed to relieve extremely high intracranial pressure. Craniotomy involves cutting a hole in the skull to remove a bone flap so that the surgeon can access the brain. The surgeon then repairs the damage (e.g., skull fracture, bleeding vessel, remove large blood clots). The bone flap is replaced in its normal position and secured to the skull with plates and screws. Figure 6. A large decompressive craniectomy is removed and the dura is opened to allow the brain to expand. Blood clots are removed and bleeding vessels are repaired. The bone flap is frozen and replaced about 6 weeks later. Decompressive craniectomy involves removing a large section of bone so that the brain can swell and expand. This is typically performed when extremely high intracranial pressure becomes life threatening. At that time the patient is taken to the operating room where a large portion of the skull is removed to give the brain more room to swell (Fig. 6). A special biologic tissue is placed on top of the exposed brain and the skin is closed. The bone flap is stored in a freezer. One to 3 months after the swelling has resolved and the patient has stabilized from the injury, the bone flap is replaced in another surgery, called cranioplasty. Tracheotomy involves making a small incision in the neck to insert the breathing tube directly into the windpipe. The ventilator will then be connected to this new location on the neck and the old tube is removed from the mouth. Percutaneous Endoscopic Gastrostomy Tube (PEG) is a feeding tube inserted directly into the stomach through the abdominal wall. A small camera is placed down the patient's throat into the stomach to aid with the procedure and to ensure correct placement of the PEG tube (see Surgical Procedures for Accelerated Recovery). The recovery process varies depending on the severity of the injury, but typically progresses through stages: coma, confusion / amnesia, and recovery. When a patient is in a coma, his or her eyes are closed and they show minimal reaction when spoken to or stimulated. Movements that may be seen at this time are basic reflexes or automatic responses to a stimulus. The brain wave activity in a comatose person is very different from that of a sleeping person. When a patient begins to awaken, the first natural response is that of bodily protection. Patients at this stage will move away from any stimulus or tend to pull at items attached to them in an attempt to remove anything that is uncomfortable or irritating. His or her eyes may be open more often, but they may not be aware of their behavior or be able to interact in a meaningful way. It is common for a patient to respond to each stimulus (hearing, seeing, or touching) in the same way. Responses may include increased rate of breathing, moaning, moving, sweating, or a rise in blood pressure. As the patient continues to wake up, their interactions may become more purposeful. They may look at a person and follow them around the room with their eyes, or follow simple commands such as “Hold up your thumb.” Patients tend to be confused and may have inappropriate or agitated behaviors. Not all head injuries are the same. Patients recover at different rates and to varying degrees. It is difficult to determine at what point a patient will start understanding and interacting with their caregivers or family in a meaningful way. It is important to have patience; recovery from a brain injury can take weeks, months, or even years. Many family members express feelings of helplessness when their loved one is in the NSICU. You are not alone. Please take care of yourself and use your energy wisely. Visiting hours are limited in the NSICU. Too much stimulation can agitate the patient and raise his or her blood pressure. You can most effectively convey your concern by sitting quietly and holding your loved one's hand. Be aware that the patient, though silent, may hear anything you say. Never speak as if the patient were not there. As patients recover, they need help understanding what has happened to them during this “lost period of time.” Keep in mind that the recovery of consciousness is a gradual process – not just a matter of waking up. Progress is usually tracked in three areas: movement, thinking, and interacting. You can help by keeping a diary of their progress. Family photos may help with regaining memory. Most patients are discharged from the hospital when their condition has stabilized and they no longer require intensive care. A social worker will work closely with the family as preparations are made for a return home or for transfer to a long-term care or rehabilitation center. A long-term acute care (LTAC) facility is a place for patients who have stabilized from their initial injury but who still require a ventilator or frequent nursing care. 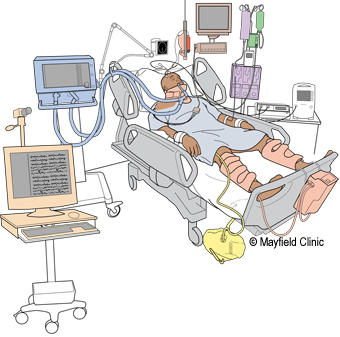 Many patients are discharged to an LTAC to continue being weaned from the ventilator. Once off the ventilator, they can be moved to a rehabilitation or skilled nursing facility. A rehabilitation facility is a place for patients who do not require a ventilator but who still require help with basic daily activities. Physical and occupational therapists work with patients to help them achieve their maximum potential for recovery. Rehab facilities are either Acute Inpatient Rehab that require patients to participate in 3 hours or more of rehab a day or a Skilled Nursing Facility (SNF) that provide 1-3 hours of rehab a day depending on what the patient can tolerate. Recovering from a brain injury relies on the brain's plasticity—the ability for undamaged areas of the brain to take over functions of the damaged areas. It also relies on regeneration and repair of nerve cells. And most importantly, on the patient's hard work to relearn and compensate for lost abilities. A physical therapist helps patients rebuild and maintain strength, balance, and coordination. They can work with the patient in any facility. An occupational therapist helps patients to perform activities of daily living, such as dressing, feeding, bathing, toileting, and transferring themselves from one place to another. They also provide adaptive equipment if a patient has difficultly performing a task. A speech therapist helps patients by monitoring their ability to safely swallow food and helping with communication and cognition. A neuropsychologist helps patients relearn cognitive functions and develop compensation skills to cope with memory, thinking, and emotional needs. Always wear your helmet when riding a bicycle, motorcycle, skateboard, or all-terrain vehicle. Always wear your seat belt and ensure that children are secured in the appropriate child safety seats. Avoid falls in the home by keeping unsecured items off the floor, installing safety features such as non-slip mats in the bathtub, handrails on stairways, and keeping items off of stairs. Avoid falls by exercising to increase strength, balance, and coordination. Store firearms in a locked cabinet with bullets in a separate location. Wear protective headgear while playing sports. If you have questions, please contact Mayfield Brain & Spine at 513-221-1100.
hydrocephalus: an abnormal build-up of cerebrospinal fluid usually caused by a blockage of the ventricular system of the brain. Increased intracranial pressure can compress and damage brain tissue. Also called "water on the brain." intracranial pressure (ICP):pressure within the skull. Normal ICP is 20mm HG. ischemia: a low oxygen state usually due to obstruction of the arterial blood supply or inadequate blood flow in the tissue. ventricles: hollow areas in the center of the brain containing cerebrospinal fluid. There are four ventricles: two lateral ventricles (one on each side of the brain), the third ventricle, and the fourth ventricle. Through our affiliation with premier hospitals in the Greater Cincinnati-Northern Kentucky region, Mayfield physicians provide the most highly skilled surgical care available to patients who suffer neurotrauma. We collaborate with trauma surgeons, neurologists, and neurointensivists, who work one-on-one with patients and families. And we work closely with dedicated nurses, who are trained to help you understand your loved one's condition and gain access to available resources. For support groups in the Greater Cincinnati area, contact the Brain Injury Association of Ohio Support Group at (513) 542-2704.